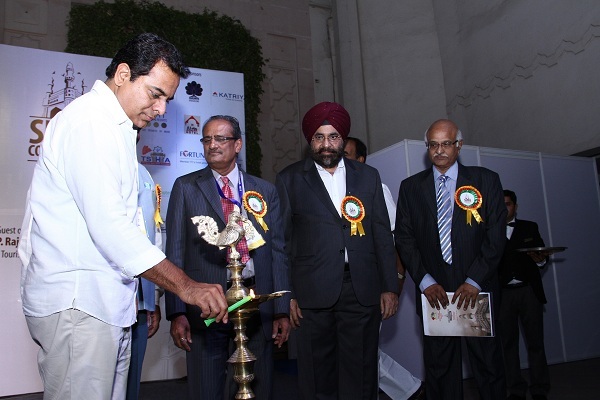 The South India Hotels & Restaurants Association (SIHRA) Convention 2015, the platform for hoteliers & Restaurateurs from whole of South India was inaugurated by Sri Kadiyam Srihari, Deputy Chief Minister & Minister of Education – Telangana State in the presence of Sri K T Rama Rao Garu Hon’ble Minister of Panchayat Raj & IT – Telangana State and Sri. P Rajavelu Garu Hon’ble Welfare and Tourism Minister – Puducherry was the Guest of Honour. The three day annual convention has brought together over 600 delegates from the southern states including Telangana, Andhra Pradesh, Tamilnadu, Karnataka and Kerala to meet and discuss the trends and opportunities in the hospitality sector. This year, The SIHRA Convention is themed Redefining Hospitality. Monetising Tourism. and focuses on the emerging technologies, Human resource management along with other recent trends in F&B and restaurants. A special session with members of the department of tourism both at the regional and national level is organized to ensure a direct interface for the participants with the Government officials. A trade show is also organized on the sidelines of the convention where leading suppliers and organizations related to the Hospitality Industry showcase their products and services. The second day of the convention enables participants with educative and motivating business sessions delivered by eminent speakers from the industry on wide range of topics includes – Online Business- Impact of technology in the hospitality industry & role of Travel & trade, F&B, New concept based restaurants, restaurant chain, HR practices in Hospitality, Cost cutting, Sustainability of labour, Branding budget hotels, Franchise, Projects (New Methodology & Sourcing), Role of young entrepreneurs, Role of Government in formulating policies for hospitality etc. Speaking on the occasion Mr. D.V.S. Somaraju, Chairman of the Convention Organizing Committee – Southern India Hotels & Restaurants Association (SIHRA) said, “The SIHRA convention is a step to further enhance the bonding amongst the South India Hospitality players and identify opportunities for enhancing the trade in line with tourism across regions. South India, by virtue of a strong presence of IT sector offers a plethora of opportunities to the industry and SIHRA convention is designed to brainstorm on some of the challenges faced by the industry, and focus on the strategies to benefit from emerging trends and opportunities in the industry. Moreover the convention is a fantastic opportunity for the South Indian hoteliers to interact with members of the department of tourism both at the regional and national level to address various issues pertaining to the industry and focus on growth and development of the industry. All New Way of Trading Stuff Online With Faida.com! Best 4 Memory Techniques To Develop A Photographic Memory Like Sherlock! Zovi.Com In-Depth Review – My Shopping Experience! How I Created Arjun Rampal’s Celebrity Look With Zovi.com!